Enisum is an Italian atmospheric black metal band from Susa Valley (Val di Susa), the longest valley of Italian Alps, near Turin. They took their name from a local mountain, since Enisum is the anagram Musinè mountain, spelled backwards. The band was formed in 2006 by Lys as his personal project and self-released several demos, without any proper distribution. 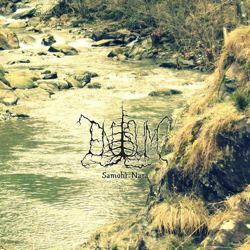 Finally in 2014 they signed to Dusktone label and in October 2014 their first professional full-length album entitled “Samoht Nara” was released. The band labels its music as Arpitanian black metal, a term that reveals the influences from Cascadian black metal in their sound and the significance of their homeland’s nature in their inspiration. Arpitania is a wide territory, including regions of Italy, France and Switzerland, where the Arpitan language is spoken or was used in the past. In “Samoht Nara“, Lys has the help of Leynir in bass and Epheliin in female vocals. This is the first work from the band I am listening to and I actually see it as their debut album. Enisum play melancholic nature-inspired black metal, with pagan black metal influences and post-metal references in their dark nostalgic atmosphere. Their music is based completely on their wonderful guitars and vocals, without any synths or folk instruments. They use however many acoustic guitars, adding some enchanting tranquil passages in their compositions with an almost neofolk mood. The screaming vocals of Lys are perfect for the band’s somber atmospheric music, while the few clean female vocals add another level of emotional dynamic and beauty in their songs. The rhythm of their compositions moves from mid tempo parts, to faster outbreaks and slower relaxing passages, all in great harmony. The production is very good, giving the band a very natural organic sound, equally raw and clear. Unluckily the lyrics are not available in the CD, or on their official pages, but based on the track titles, they seem to sing both in English (I can understand some of the lyrics) and in their native language. Of course the album is an ode to the Arpitanian Valley, dedicated to nature, rivers, mountains and animals around us. “Samoht Nara” is a wonderful album, that surprised me with its quality, simplicity and honest atmosphere. In my opinion it is one of the best works of this genre that every fan of atmospheric “Cascadian” black metal (and not only) should check. Furthermore it comes in a nice digipak CD edition by Dusktone, with beautiful nature photography and artwork by Acrosome / Dusktone lab. You can visit Enisum’s official Facebook profile for more info, or their label’s Bandcamp page, where you can listen to the entire album.